RESEARCH: PerformLaw collects data to understand the true state of the legal market and to help our clients to be constantly relevant and above their law firm competitors. See below for some of the research results we have found. 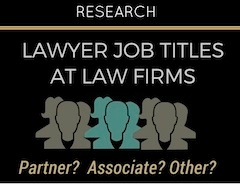 We have collected data on the attorney JOB TITLES of those practicing at law firms of various sizes in legal markets across Louisiana, Texas, Florida, Alabama and Mississippi. 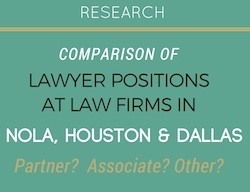 This research uses the data collected to compare the Job Titles of lawyers working at various sized law firms in New Orleans,Houston and Dallas.